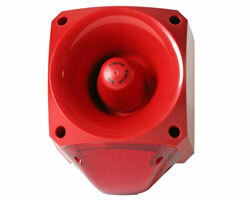 High output sounder beacons certified to EN54. Connections are made to the base during the initial wiring phase which results in faster and more reliable installation. In addition, the head is fixed by quarter turn fasteners avoiding the need to screw up four individual screws thus enabling faster installation and accurate seal compression for weatherproofing. The Nexus Sounder Beacon is available with a high efficiency LED or high output xenon beacon. The combination of a powerful sounder and high output beacon ensures a very effective audio-visual signal. 110dB and 120dB units, as well as AC variants, are also available.